Nostalgia Factor: High; this red box screams comfort. 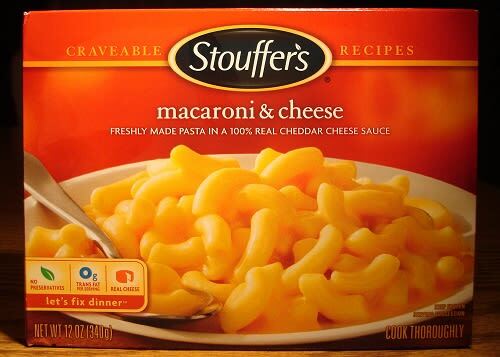 Stouffer's is homestyle mac n cheese at its best. Once you dig beneath the weirdly rubbery top film, the tender, oversized elbow macaroni underneath is thickly coated in creamy, pale yellow cheese that actually tastes like your mom had her hand in making it. Out of all the M&Cs we tried, Stouffer's had the heartiest texture, making it a go-to for ruthlessly cold winter nights.